‘Akhil’ is probably one of the most awaited films this year. Directed by the talented V V Vinayak, this film has hit the screens after a huge round of promotions. Let’s see whether Akhil impresses with his debut film or not. Akhil(Akhil Akkineni) is a happy go lucky guy who falls in love with Divya(Sayesha Saigal). He keeps chasing her and when the couple starts getting close to each other, Divya is suddenly kidnapped by some African nationals who are also in search of a scientific ball called Jua. What will Akhil do now ? How is Divya connected to these dreaded criminals ? What is this Jua all about ? To know answers to these questions, you need to watch the film on the big screen. One of the biggest assets of the film is Akhil himself. The young hero makes a striking debut and is surely set to carry the Akkineni legacy forward. Akhil is exceptional with his dances and has performed his action sequences also quite well. Expressions wise, he needs to get better but his dialogue delivery and body language are fine. Sayesha Saigal looks pretty and is definitely a find for Tollywood. She has amazing screen presence and is set to become a top star in the future. Being a trained dancer, she impresses big time in all the songs. Credit should also go to the way songs have been lavishly shot and choreographed. 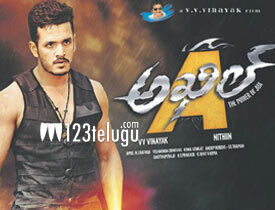 Akhil’s introduction fight and the first song have been executed quite creatively. First half of the film is racy and moves at a brisk pace. Concept of the film is decent and the first fifteen minutes are impressive. One of the biggest drawbacks is V V Vinayak’s direction. One can easily say that Akhil is his weakest film till date. The way he has narrated the film and executed some key scenes during the second half is pretty bad. Second half loses steam and the entire African episode and climax looks jaded and out of place. Graphics used are below par and spoil the mood of the film completely. The black leopard fight, under water episode and climax plane fight have been hampered by some poor VFX work. After setting up the film well till the interval point, Vinayak brings in some silly comedy scenes and drives away the seriousness in the plot. Anup Rubens’s music is the best in the music department. Background score by Mani Sharma is quite impressive and so were the dialogues. Camera work is decent in the songs but is below par during the second half. Even though the art department tried hard to bring in the African effect with their sets, some shoddy work by the graphics team make matters worse. Coming to the director V V Vinayak, he has done a mediocre job and could not execute what was on paper. After a point, he rushes through with the film and ends it in a hurry. Also, the regular heroism which is showcased in all his films is missing big time in Akhil. On the whole, Akhil is a decent launch pad for the Akkineni scion. He is exceptional with his dances and gives an all round performance in his debut film. Interesting premise and some good songs are basic assets. But a below par narration, outdated second half and over the top graphics spoil the mood and makes this film just an average affair. Watch it only for Akhil Akkineni’s impressive show.